Sometimes summer in SoCal can be a little brutal. Even though we are just a 20 minute drive to Newport Beach, where it usually tops out at 85 degrees during the hottest months, we live & work as far east in Orange County as you can get so we get zero beach breeze during the summers. Between July, August & September it is very common for temperatures to hit triple digits! That’s right… we’re talking 102⁰ & 105⁰ degree days, 5-7 days a week. The last thing I want to do on days like that is turn on the stove or eat a heavy meal. This weekend we are heading down to Temecula Wine Country with Chris’s boss & his boyfriend for some wine tasting & relaxation. I figured I’d make us some light salads to come home to. It will be the perfect thing to have after a day of drinking in the hot desert sun. Also we can grill and keep the heat outside. We eat salads here all year round but summer is my favorite time to try new ones. Chicken, fish, shrimp. Everything is fair game. 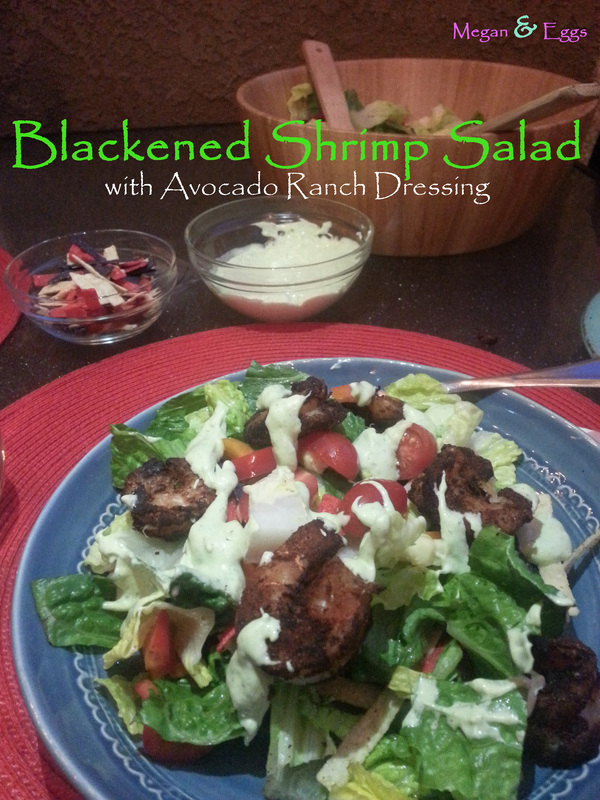 So far, this is one of my favorite at home shrimp salads. Enjoy! 1. Mix shrimp seasoning together in deep bowl. Remove from bowl and place on parchment paper and allow to sit. 2. Compile salad using lettuce, peppers, corn, and grape tomatoes. 3. To make salad dressing blend Ranch dressing, avocado, lime juice and cilantro until smooth. Add more cilantro to taste. 4. Skewer shrimp 4-5 per skewer. Allow room in between each shrimp to cook. 5. Grill 3-4 minutes per side. 6. Toss salad with dressing and top with skewer of shrimp.